The good, the bad, the sad, and the lovely. You are here so God can experience the world through your eyes. All over again … because of you and what you do. It is the most sacred and treasured thing you can do. All that I see, do, and say, treasured gifts to reflect in my old age. 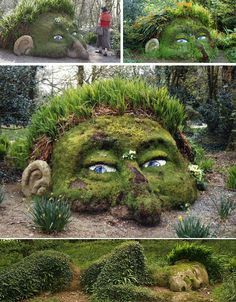 After taking the photos I had an urging to make something from the earth that would honor God and bring me some peace like I had as a child willingly trusting him every step of the way as I explored the outdoors. I remembered a praying shrine at Girl Scout camp as a little girl where I felt the presence of the Lord while standing there praying by myself. My leader had to drag me away from it because I was mesmerized by the wonderful peace and tingling feeling as I felt the Lord presence where I stood among the fallen leaves and trees on top of a hill. 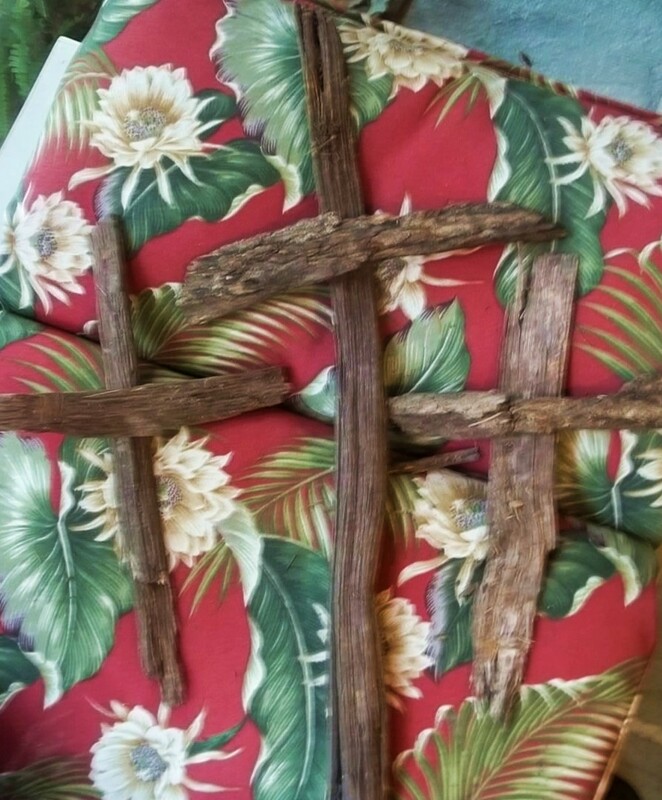 I walked out into my yard and gathered sticks and bark to make crosses. I found some wood from the oak tree hit by lightning in story from my book Living In the Realm Of Miracles and Angel Encounters and it was called, “Alpha And Omega Tree“. This wood was sacred. Lightning had gone down the center of this mighty oak tree in my back yard and had exploded this tree from the inside out. 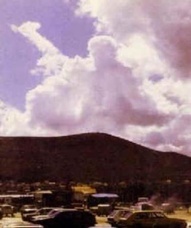 God had protected our house that stormy night. I felt the urgency to hurry as the wind picked up and the sky was turning grey. Suddenly thunder was heard overhead and rain began to fall. A sense of calm overcame me upon the first raindrops. They began to pick up speed as the drops splashed around me on the dry ground. I hurried to the protection of my umbrella over my patio table to get my journal and write… when suddenly what do I hear bellowing loudly from the tropical plants around my deck? Why the croaking of frogs! 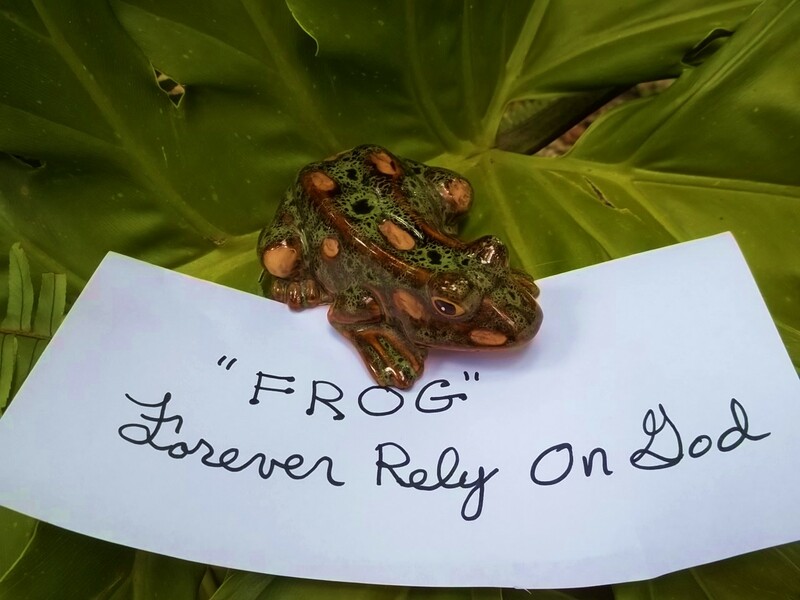 FROG = Forever Rely On God!! How directly does God communicate with us if we only take the time to listen. There I sat writing about the Lord’s timing and now instantly it is cool and refreshing. Only a minutes earlier it was much too hot to write and I had complained to God about this! Timing is everything in life. Don’t miss God’s comforting cool rain in you hot day of worrying about details and all the “What Ifs” in life. Allow God to lead you on a path less taken by most to a higher understanding and peace He has waiting for you…If you would only follow Him and listen to His directions in your life… Then you would hear the croaking of the frogs reminding you to forever rely on God everyday in your life. As soon as I finished writing this the sun burst out and birds began chirping. The storms of worry have moved on for today. Hope you have a FROG of a day too. 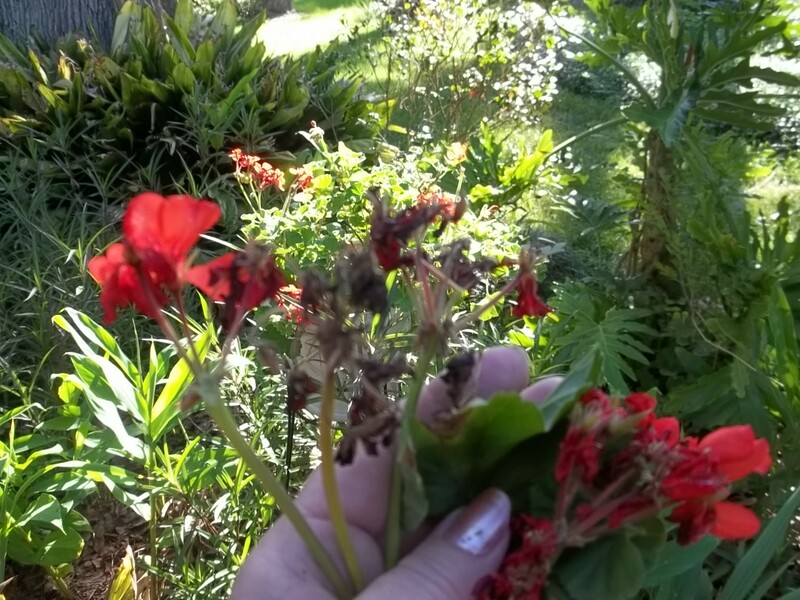 I was in the garden this morning and clipping old faded flower blooms off of my geranium plant. While doing so I began to think about our spiritual life and how God sometimes trims things out of your lives as well. Sometimes we wonder why he does this? We question his great plan for our life and sometimes feel angry at God for getting rid of things in our lives we wanted to keep and thought were good. I looked down at the cutting of dead or near dead flower booms in my hand. Some still had some new blooms attached to the old stem I had cut and others were all ready dead. I look at the tiny blooms not quite opened yet and think of how God has cut things from my life that I wanted to keep or ideas, or actions, I wanted to mature or bloom into something more. I would often get frustrated with God and question why he had taken these things out of my life when they seemed like they were just getting ready to bloom!! Then I remembered that God has the big picture for our lives and knows what is best for us. He also knows that what is true with plants is also true in our spiritual journey… Sometimes he needs to get rid of old directions, or relationships, or perhaps even dreams so he can plant new better ones in our lives that will produce much more happiness (Blooms) than the old direction we were headed in the past. We should always trust the Master Gardner with his pruning and getting rid of certain things in our lives because he sees the big picture and we only have a tiny speck of understanding compared to him in his infinite wisdom of what is right for our lives and future….Besides even I as a earthly gardener realize that pruning back a plant stimulates new growth, and produces much more flowers of beauty, and produces more fruit and new bigger growth in the plant, then if I had just left it alone to grow in its own slow way… and less productive way. I have always felt this deep sense of lost time, happiness, missed joy of living life to the fullest and always, always, feeling like time is running out. Our lives are too short to experience all there is in such a minuet short tiny sliver of time we have here on earth. It makes you wonder if there is such a thing as a previous life (Heaven) before this one. We did all start out in heaven when God decided to create life from our parents. Is it possible that we still have a long ago fragment memory of Heaven and our Creator? How else could I feel such a deep sense of sadness that no matter how long a life is lived it is never enough? It is as if I have played this role over and over again with the same sad realization that our time here is too short. Too many missed opportunities too many precious meaningful moments left undone. I am left with an overwhelming feeling that I will have so many regrets of happy moments left unlived… I have always been a very deep and serious thinker on this subject and yet free as dancing in the wind just because life feels so good sometimes. Maybe as I get older these free moments are farther between the mundane details that consume our life day after day. Does it really matter if all the dishes are clean before you go to bed? Or all your goals for the day complete? Life is only bits and pieces throughout our busy days of running around for things and errands that we will never take with us, and don’t matter. People, experiences, little moments shared with another are what matters most… Share as many special moments you can with friends and family this new year of 2012 because none of us know how many days, hours, years we have left on this earth. 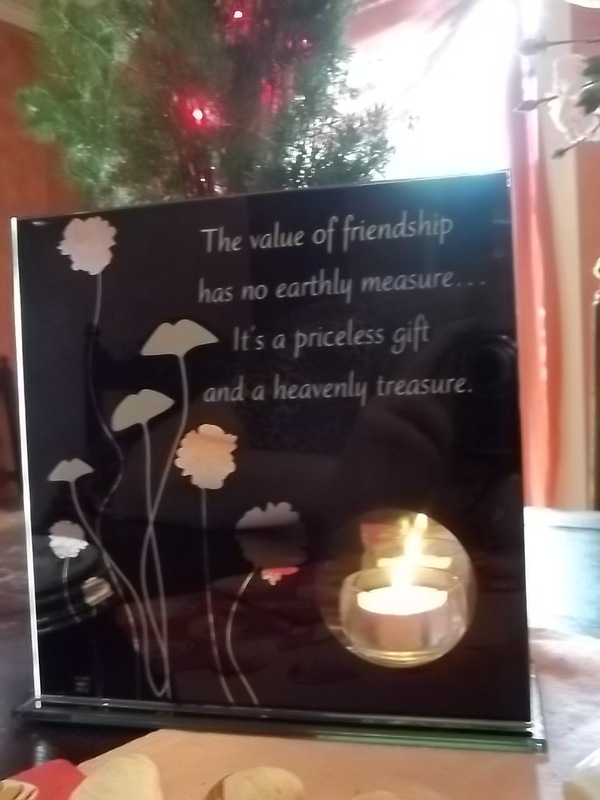 Life is precious…pass it on this year to everyone you know. You will have many returned blessings for living like this and maybe a few new friends along the way.